To say that I am a fan of the films of Pixar would be to underestimate the power and meaning of the word "fan", bearing in mind that the word is short for "fanatic", and a certain degree of terrifying obsession is implicit to its usage. I love Pixar. I have done ever since I saw the original Toy Story at the age of nine, and have waited with bated breath for each subsequent release from the studio. Rarely a year goes by that one of their films does not make my Top Ten, and Toy Story 3 is probably my favourite film of this still young decade. I like them a lot, is what I'm saying. When you love someone as much as I love Pixar, you want to think only the best of them. Sure, they can be a little grumpy from time to time, you say to yourself, and maybe they could say please and thank you more often, but deep down they're good people. The problem with that is that there comes a time when the person you love comes home drenched in blood and wants you to say that, if anyone asks, they were at home all evening, then asks you to burn their clothes whilst they go and have a shower. It's at this point that you either realise that you need to go and buy some matches, or that things have gone very wrong indeed. It is with a heavy heart that I have to say that, yes, Cars 2 is the homeless man they ran over whilst drunk of Pixar's filmography. It's a dirty little secret that they want us all to accept because, hey, they've been good in the past, right? This is just a rough patch, but remember WALL-E? Remember Up? Those times could come again if we'll all just accept that they made one tiny mistake. Part of me wants to believe them and let this one slide, but I just can't. I could say that it's just a pure commercial endeavour for Pixar- the first Cars, whilst not their biggest hit, made obscene amounts of money from merchandising - intended to bankroll their more artistically adventurous fare, but that argument only goes so far. The problem with setting the bar so high for yourself (and an entire industry) is that when you fail to meet your own standard, you're going to fall hard. The key problem with Cars 2 is that it loses sight of the two key things that Pixar have prided themselves on for more than a decade; story and emotion. The first Cars, whilst not a great movie (when I did a list of my favourite Pixar movies it was dead last) has a lot of heart thanks to the elegant simplicity of its story. It's about a young, brash racing car (Owen Wilson) who learns that he needs to slow down and appreciate life, rather than just zooming past it all. Well-worn territory, perhaps, but there is an earnest honesty to the way in which the material is treated, coupled with director John Lasseter's clear love of the grand mythology of Route 66, that gives the film a lot of charm. It's a paean to a small town Americana that doesn't really exist anymore, and the slightly old-fashioned approach is perfect for that story. 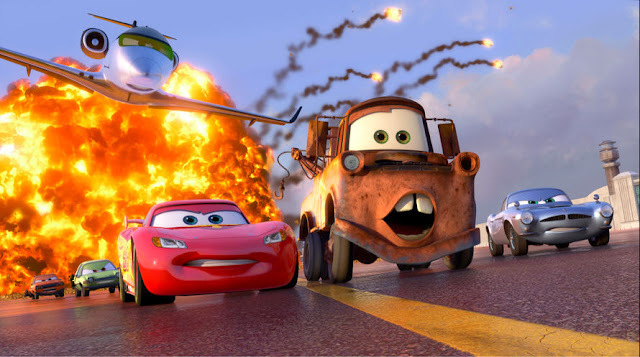 Cars 2, by contrast, is a load of noisy nothingness that doesn't even have a basic, central message to hold its disparate plot points together. Lightning McQueen is challenged to a global Grand Prix sponsored by the inventor of a new, cleaner form of energy (voiced by Eddie Izzard), and because he's only just got back from another tournament and feels sorry for abandoning his best friend, Mater (Dan "Larry The Cable Guy" Witney) he takes him along for the ride. It seems like the film is going to be about their friendship and how it is tested by the rivalry between McQueen and the Italian F1 car Francesco Bernoulli (John Turturro), and it sort of is for a while. Then, once the film moves to Japan - which, in its favour, is a brilliantly realised version of a bizarre alternative universe - it suddenly becomes a Man Who Knew Too Little-style mistaken identity film in which Mater is taken for an American spy, and becomes an unlikely cog in a story of international intrigue involving two British secret agents (Michael Caine and Emily Mortimer). From this point onwards, the film becomes needlessly convoluted as the two opposing sides of the story - the one about friendship being tested by a high pressure environment and the one about espionage and assassination - confront and undermine each other. The spy stuff has no weight to it because the friendship element is so under-developed, and the friendship is so under-developed because any moments between Mater and McQueen are interrupted by the spy elements. It's an endless cycle that makes the film feel empty and boring for about eighty per cent of its running time. By the end of the film, when Mater is racing through the streets of London with rockets strapped to his back, I was struck by just how far removed from the original Cars 2 had become. It seemed less like a continuation of the film than a demented piece of fanfiction that had accidentally been greenlit. In its favour, the film does look amazing. There's a basic competency to Pixar's work that ensures that nothing in it looks substandard or misconceived, but the problems with the film lie not on the surface, but under the hood. There's no heart or soul to Cars 2, no love or beauty. It feels like a film dreamed up by an accountant. If it had been created in the Cars universe, it would have been written and directed by a Ford Focus; dependable, steady, boring.